Concorde Barberry, Berberis thunbergii 'Concorde', is a very slow growing, compact shrub. 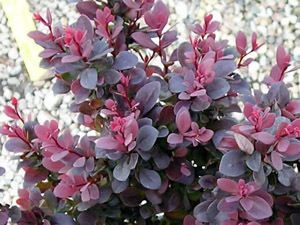 Small red-purple leaves hold their color well even in heat, and it maintains a deeper color than most other purple leaved varieties. Concorde's size makes it ideal for the foreground of any border. It has the a 2 foot height and a 3 foot spread with a nice rounded shape, allergy free, and is pest tolerant. Persistent red fruits form in fall along with the red, orange and yellow foliage color. It tolerates most light exposures and soils, but purple-leaved varieties will turn green in the shade. This plant will grow in dry soil.